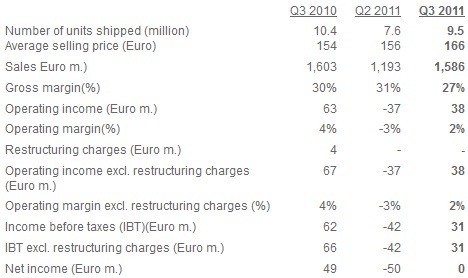 The results of Q3 2011 for Sony Ericsson are in and it shows a little progress by the company. Comparing to Q3 2010, the net income and shipments were still a low. About 9.5 million devices were shipped by the company during the quarter which is 33% more from the 7.6 million it shipped last quarter but down from the 10.4 million it shipped during Q3 2010. Android-based Xperia smartphone sales now account for more than 80% of sales and the company has shipped 22 million Xperia smartphones to date. Bert Nordberg, President and CEO of Sony Ericsson has said that their primary focus will only be on smartphones in the year 2012. Well, that was a quick decision. For more on the report visit here.